The Best Bouillon Cube Ever! | Crappy Kitchen - Good Dinners! The Best Bouillon Cube Ever! I cannot believe I have neglected to talk about this until now. I am a devotee of all things fresh, and as locally grown as possible (just read my blog!). But, there are times, lots of times actually, when I need to use the best bouillon cube ever! Yes, in the ideal world I would have bags of homemade chicken and vegetable stock in my freezer. As energetic as I am, I still don’t seem to be able to muster up the enthusiasm to boil chicken carcasses or beef stewing bones to make lovely stocks and broths to add to my dishes. I know that broths can be bought in cans or cartons, and they are good alternatives to the real deal. However, they take up lots of room and I would constantly be running out of them. I never really liked bouillon cubes. They were either too salty, had too many artificial ingredients, or both. It was very frustrating to make some really fabulous dish only to be ruined be a crappy stock cube! 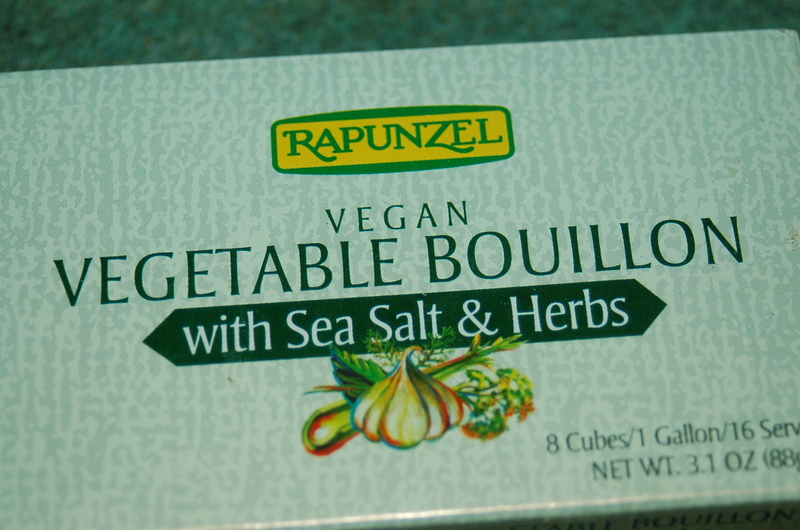 This all changed when I discovered the bouillon cubes made by the Rapunzel brand. The cubes are nice and big (frequently, I only need half a cube), and the ingredients, straightforward and fresh (sea salt, organic non-hydrogenated palm oil, organic herbs & spices). I buy the one with sea-salt because I am a saltaholic, (the salt comes from the French Atlantic coast and is sun-dried – yum), but you can also buy it without salt, and even without herbs. I used them anytime I need a broth, and just add water. I store them in the fridge and that makes them easier to crumble into dishes. They can be found in well-stocked supermarkets and specialty shops. I hope you can find them and give them a try. This entry was posted in pantry and tagged best stock cube, chicken broth, rapunzel bouillon, stock cube, stock cube with herbs, vegetable bouillon cube, vegetable broth. Bookmark the permalink. Pingback: Smokey Pork With Capers & Penne – So Good! (serves 6 in a hurry!) | Crappy Kitchen – Good Dinners! Pingback: Very Handy Chicken & Escarole Soup (serves 4-6) | Crappy Kitchen – Good Dinners! Pingback: Delightfully Tofu-y Stew (serves 4 as main course or 6 as appetizer) | Crappy Kitchen – Good Dinners! Pingback: Slow-Cooked Pork with Pungent Juniper & Caraway (serves 12-14) | Crappy Kitchen – Good Dinners! Pingback: Rich Chipotle Pork Stew For A Crowd! (serves up to 12) | Crappy Kitchen – Good Dinners! Pingback: Rich Meaty Ragu In Baked Pasta (serves 12-14) | Crappy Kitchen – Good Dinners! Pingback: Bacon And Ham Soup With Broken Spaghetti (serves 4) | Crappy Kitchen – Good Dinners! Pingback: Hearty Tofu & Cauliflower Soup (serves 6) | Crappy Kitchen – Good Dinners! Pingback: Medicinal Kale And Tofu Soup – Too Healthy for Words! | Crappy Kitchen – Good Dinners! Pingback: The Ides Of March, The Wall of Secrets – And, Soup Of The Gods | Crappy Kitchen - Good Dinners! Pingback: Do You Want Curry Chips With That? (with your Baked Curried Cod that is!) Serves 4-6 | Crappy Kitchen - Good Dinners! Pingback: Escape To New York and Wildly Good Bucatini al Ragu – Inspired By Pasta Bought From Eataly and Of course ITALY! | Crappy Kitchen - Good Dinners!